The upcoming film Good News stars actors like Kiara Advani, Kareena Kapoor, Akshay Kumar, and Diljit Dosanjh. However, the real star of the show is Kareena's son Taimur, who grabs all the limelight with his cute antics. The actress took to her Instagram account on Wednesday to post stories from the shoot that are winning the Internet. Akshay Kumar and Kareena Kapoor Khan’s forthcoming film Good News has begun its shoot in full swing. The film will also feature Diljit Dosanjh and Kiara Advani in supporting roles. Kiara took to her Instagram account on Wednesday to post stories from the sets of the film. The first story shows her morning beauty routine while another displays their lunch time on the sets. However, it is her last video clip with little Taimur that is grabbing all the headlines, stealing away all the thunder. The actress added a caption which said that he is the real star on the sets. 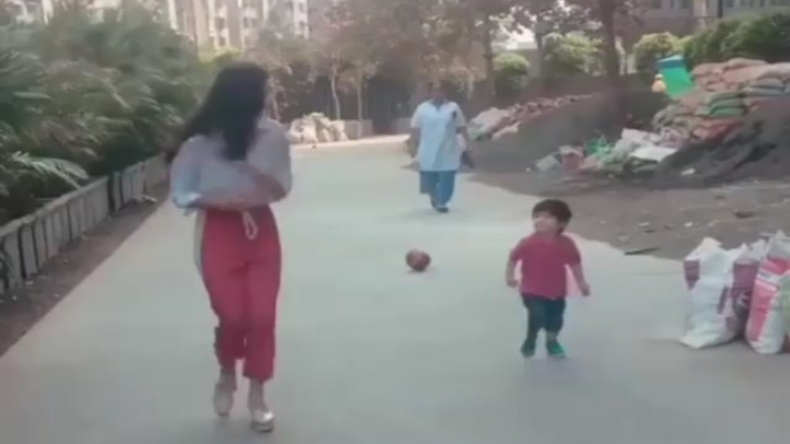 The story shows Tim looking at Kiara but instantly runs back to play with his nannies with the red ball for him on the sets. The film Good News is a romantic comedy starring Akshay Kumar and Kareena Kapoor as a couple who are trying hard for a baby. Kiara and Diljit will be seen in supporting roles. Recently, Kumar also shared his pic with Kareena stating that he was trying to do his best to cope up with the glamorous actress. On the other hand, Kiara has been occupied for days now. Recently, the actress shot an advertisement for a housing brand with Vicky Kaushal who was her co-star in lust stories. She has also performed in the song Ram Loves Seetha from an upcoming Telugu film with Ram Charan in lead. The actress also shared a song’s video clip featuring her with Kaushal. The diva has also shared her look from the Telugu hit Arjun Reddy’s Hindi remake, Kabir Singh.